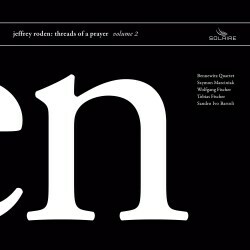 This release follows on from Solaire Records’ first volume of music by Jeffrey Roden (review), appearing in black to partner the previous volume’s white, and in this label’s signature glossy heft with cardboard sleeve for the jewel case and a substantial booklet with notes and an extensive interview with the composer. As with the previous volume, information on the actual pieces is sparse, but there is plenty of context to orientate the listener towards Roden’s creative worlds and the route he took to reach this point. This recording further extends our insights into Jeffrey Roden’s chamber works, starting with the field, a trio for violin, double bass and timpani. Morton Feldman once said, “I've been living with the minor second all my life and I finally found a way to handle it.” This might indeed apply to the field, in its sparse exploration of a very few notes, that minor second opened out into 9th intervals, the juxtaposition of timpani and lonely sounding strings taking us some way into Rothko Chapel territory and even into that of Shostakovich in the chill austerity of his final musical statements. Melodic shapes emerge and unfold slowly, the whole taking on a kind of symmetrical purity, from silence and back. In as we rise up an organ thrums a deep pedal tone under a slow melodic solo from the double bass. This elegiac tune is joined by the violin, the two strings playing in octaves and unison with impressively accurate intonation, the violin taking over, and the whole thing concluding as a mournful, all too brief duet. The first low note of the piano in threads of a prayer takes its cue from that organ pedal note, now becoming the slow tolling of a bell, above and beyond which Roden works his magic with the slightest of means. The sonority of the piano is crucial, but with so few notes this is also an ‘essence of’ – and that ‘something’ can be whatever you make of it. This is music that has the contemplative effect of a Japanese rock garden in its static beauty. 6 pieces for the unknown extends this atmosphere, but also shows how much transformative effect can be had from a change in register on the piano, a new tonality and the minutest examination of the fewest of notes. As with all of the players here, Sandro Ivo Bartoli is entirely within these pieces and entirely convincing with every note. We know he can bring down the house with Liszt, but also here by drawing us in rather than having smoke rising from the piano with technical fireworks. These minimal but quietly magnificent pieces also draw us in, captivating through poetic expressiveness and a compelling openness and honesty. I can imagine people listening to this and asking, ‘where’s the music? – there’s nothing here…’ If you are not prepared to give this recording time and become immersed then yes, it will pass you by. These are works that, like all good art, demand of us that we raise our game to meet them at least half way. This expectation and our response to it is our gain, our evolution towards new realms of beauty, and as with its partner volume I feel privileged to have been allowed access to its special qualities.